Its pretty dope to come across a virtually unknown artist and watch them manuever through their careers. I Came across Kiiara awhile back and next thing I know she has millions of plays on soundcloud. Those numbers don’t lie. The Illinois representative made some serious noise with her debut single “Gold” and hasn’t looked back. After keeping fans waiting , the songstress released her debut EP “Low Kii Savage” just last week. You should also know that Kiiara recorded this project while working at a hardware store. Talk about dedication! The project is infused with infectious beats, catchy lyrics and entrancing vocals. Watch the visuals for “Gold” and stream the EP below. If you like what you hear, you can support Kiiara by purchasing the EP via itunes. 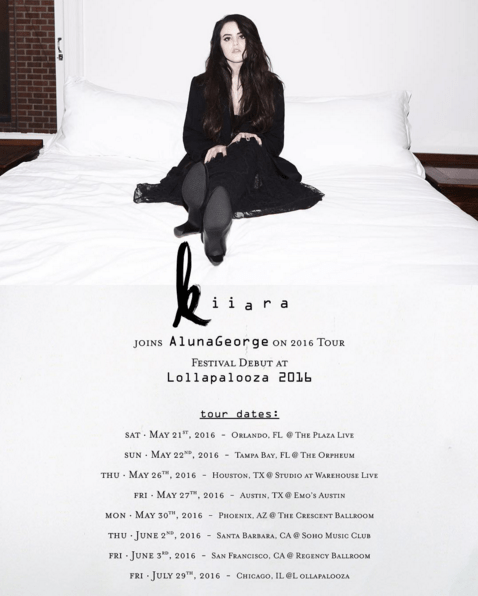 She will also be on tour with Aluna George. The dates can be found below as well.